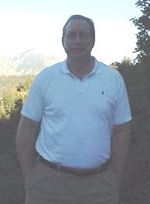 As of Jan 27th, 2007 - age 52 - 215 lbs, body fat - 9%, 6'10"
The first two photos below were taken at age 47. 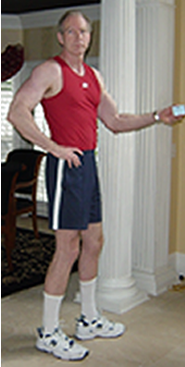 I weighed 295 lbs which qualified me for a diagnosis of obesity even though I am very tall at 6'10". My BMI was 30.8 which predicted my life expectancy would be reduced by 30%. 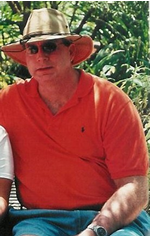 The next two photos were taken at age 50, 225 lbs, 13% body fat. 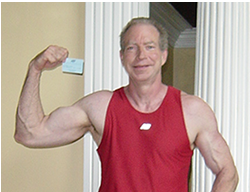 Here I just returned from my morning workout and am clowning around with my AARP card I received on my last birthday.